Video Blog: The Teaser "My legs are too long!" The Teaser requires the back to be in a Round shape. Your shape must be solid. This is crucial to the wrangling of said long legs. You must actively be doing a lot of work to create and sustain your Teaser during the entire exercise. Not just balance, but hard sweaty work is required for Teaser success. Willpower, friends! Think like an animal and master the 2-way stretch. Really just another name for the 2-way stretch, I like to think about the unrelenting oppositional forces you must employ to execute the Teaser with proper control. The work of the strong scoop/lift of the center is in a constant battle with the long reach outward and upward of all the limbs. Working in this manner will give your Teaser control, strength and balance. Awesome. Join my client Greg and I for this week's video blog. We aim to demystify the how-the-hell-can-I-do-the-Teaser-and-straighten-my-super-long-legs conundrum. Never complain about your long legs again when you see what this guy can do. Greg is 6'8″ and he's working on an 86″ Gratz Reformer in 2nd gear. When Greg first began Pilates lessons years ago, one of his goals was to be able to do the Teaser with his legs straight. Check! I speak about “3 little stretches” similar to the ones you can do in the Roll Up and the Spine Stretch on the Mat: 3 little stretches = the constant battle of the 2-way stretch! The Pilates exercises are perfect for every body. Share your own Teaser successes in a comment below. Read my full Pilates confession about the Teaser in a related post on Pilatesology. Lisa, Thank you so much for watching and sharing your comments 🙂 Funny how we all have our excuses for things – LOL. Well done Greg and Andrea! My personal teaser history is rather dramatic. My tailbone injury had left my tail kinked off to one side for nearly a decade. I wasn’t able to do the teaser until I unkinked it with an exercise from Eric Franklin’s book “Pelvic Power” which I gratefully purchased after a workshop with him in SF – talk about a game-changer. 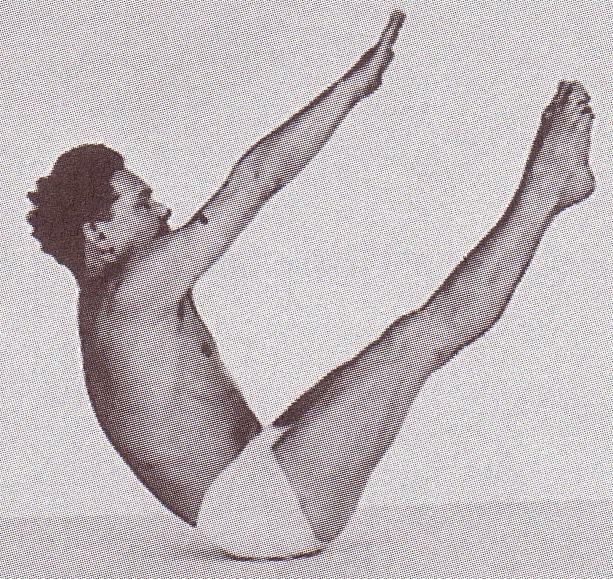 For my body, the single leg teaser was always easier on my back and enabled me to really engage my center. So many bodies, so many different stories! Thanks Eliza! I do love that single leg Teaser – I use it for myself a lot – I love to address my weaker side – it is really effective – and interesting to see what that weak side gets away with when I do the regular Teaser. And thanks so much for your praise of Greg – he’s awesome!